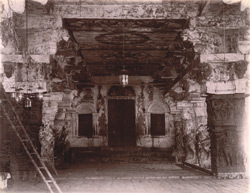 Photograph of the Rama Temple at Kumbakonam, taken by Alexander Rea in c.1892, from the Archaeological Survey of India Collections. Kumbakonam, in Tamil Nadu, was an important centre during the 9th to 13th centuries under the Chola dynasty. There are fifteen temples in the town dedicated both to Shiva and Vishnu. Some of these temples have Chola foundations with later extensions constructed under the patronage of the Vijayanagara and Nayaka rulers. The Rama Temple dates to the 16th and 17th centuries. It is entered through a gopura of the Nayaka period that leads to a large columned mandapa or hall. The pillars are decorated with carvings in the Vijayanagara style of dancers, maidens and divine couples. The outer piers are carved as riders on rearing horses and yalis.